Identity, difference, and translation are important theoretical concepts in the field of translation studies and postcolonial studies. It is a basic assumption of this seminar that aesthetic and cultural translation is exposed to the paradox of identity and difference and that this paradox is particularly evident in artistic performance practices such as dance and choreography. Focusing on the artistic work of different African choreographers and dancers like Germaine Acogny (Senegal), Koffi Koko (Benin) and Mamela Nyamza (South Africa) we will address artistic translation practices under postcolonial conditions in the global art market of so-called ‘contemporary dance’. 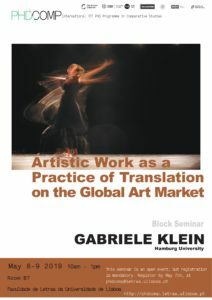 With reference to theoretical concepts, the aim of the seminar is to illustrate how contradictory, hybrid, and fragmented the cultural and aesthetic translation process is, how the global art market shapes the artistic strategies of translation, and how aesthetic productivity lies in the impossibility of translating cultural experience artistically. Gabriele Klein is Professor for Sociology of Dance and Performance Studies at Hamburg University and Director of the Center of Performance Studies. She is member of the Excellence Cluster Understanding Written Artefacts at Hamburg University (2019-2025) and has been the speaker of the research group Translating and Framing. Practices of Medial Transformations (2015-2018), where she also conducted the project Translating Movements. (Dance-)aesthetic Transformations and their Medial Framings – as exemplified by ‘African Dance’. Her English book publications include Emerging Bodies (with S. Noeth), Performance and Labour (with B. Kunst), Dance (and) Theory (with G. Brandstetter).